【Greetings】Merry Christmas & Happy New Year! Prix Versailles Award, in association with UNESCO, recognizes the most remarkable projects that balance both cultural and commercial elements. 70 excellent projects are selected from 6 regions/continents. Congratulations Kokaistudios for winning yet another award! AHEAD Award has just announced Brasserie at the Four Seasons Hotel Kyoto to be the winner of 2018 Asia's Best Restaurant. Congratulations to the architects at Kokaistudios for being recognized by the panel of hotel industry gurus for the design of Brasserie! Best of luck in running for the Ahead Awards Global prize. Kokaistudios' restaurant project, Brasserie in Four Seasons Kyoto was nominated finalist for the "Hotel Dining" category in the running for Interior Design magazine’s 2017 Best of Year awards. Now at its 12th year, Interior Design's Best of Year award is one of the most highly regarded awards in the design industry. Congratulations to Kokaistudios! We are greatly honored to have photographed this amazing project. 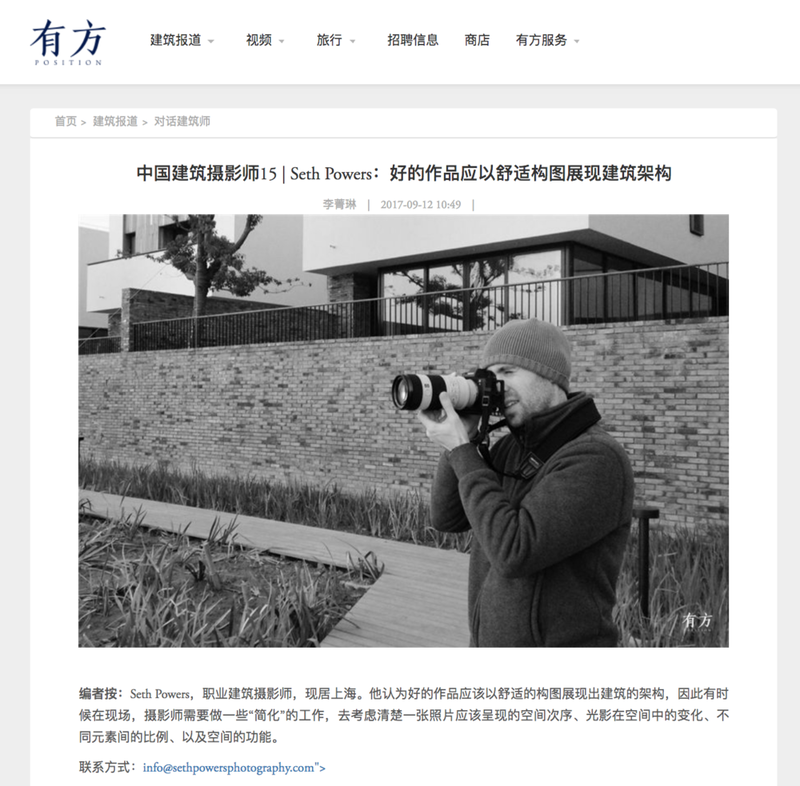 It was an honor to be interviewed for ArchiPosition's China Architecture Photographer series. They profile some of the leading architecture photographers in the industry here in China and I'm proud to be among such talent. Big thanks to the editors! Thanks Conor from 99 Percent Lifestyle for getting in touch! Click on the image to check out the interview on their website. 99 Percent Lifestyle is a magazine that focuses on the worlds best creators and entrepreneurs with the aim to inspire its readers to live life to the full and be more creative. 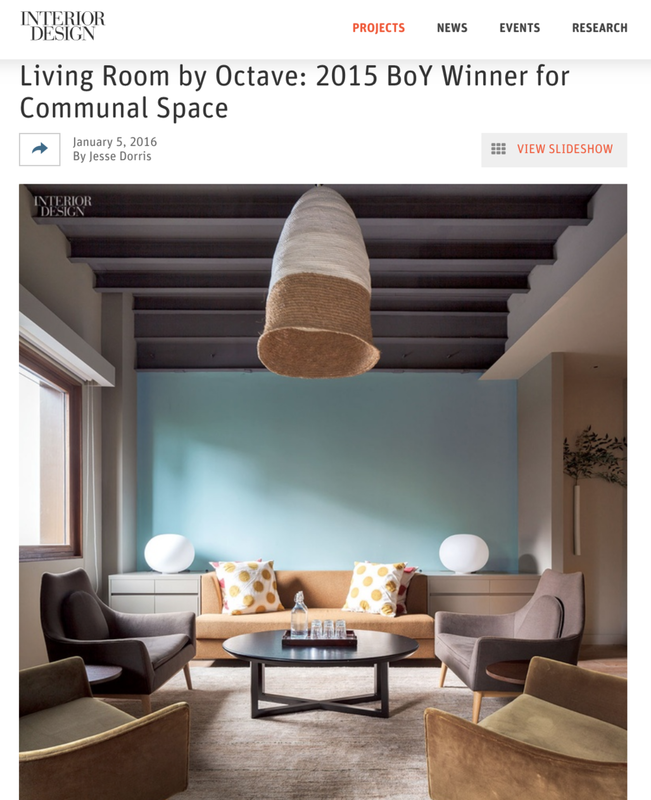 Congratulations Tsao & McKown Architects for winning the Communal Space category of 2015 Best of Year Award by Interior Design with their project in Shanghai, The Living Room by Octave! "An adaptive reuse of a historical building in Shanghai China, The Living Room is built to create walkable, mixed-use alternatives to China’s rampant urbanization. The center is a hub for services including family therapy, art therapy, yoga, a health-oriented restaurant with food and beverage programs, and a small-scale urban farm. " "Spanning 30 metres in length, a twisting metal framework is clad with a polished stainless steel on one surface and a painted aluminum alloy on the other. Acting as a gateway to the Xintiandi retail mall, the construct explores the cultural relationships between the city’s occupants and urban hardscape through reflection."